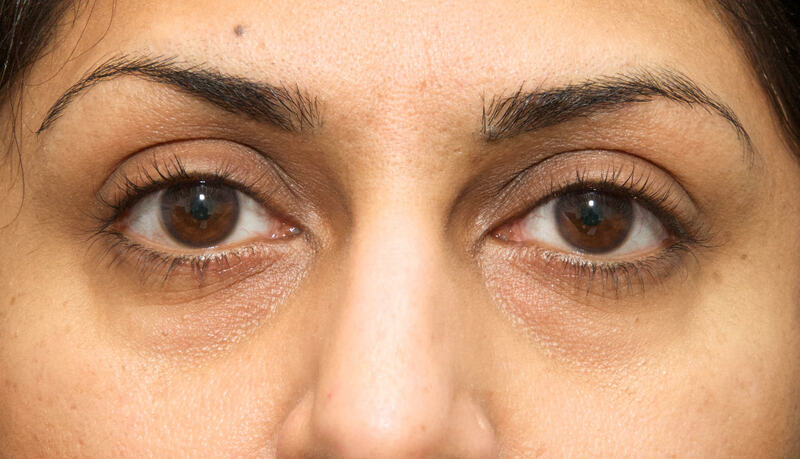 This well established very popular non-surgical treatment is appropriate for some patients with lower eyelid dark circles or hollows (also referred to as “tear troughs” or “tear trough defects”). In the lower eyelid a weakening of the orbital septum, and in the cheek area (the “mid-face”) a loss of soft tissue volume, tend to accentuate the appearance of the lower bony orbital margin which lies between the lower eyelid and the cheek. This also leads to the appearance of lower eyelid fat pockets and together these can lead to a “tear trough” depression, or dark eyelid shadow or hollow eyelid. Click here to watch a short video of a patient undergoing tear trough rejuvenation treatment This shows how this is undertaken without the use of any needles close to the eye. The tear trough is a specialised area of the face. You should ensure that tear trough injections are undertaken by an expert in the field after a consultation to determine your suitability for this treatment. An oculoplastic surgeon is such an expert. 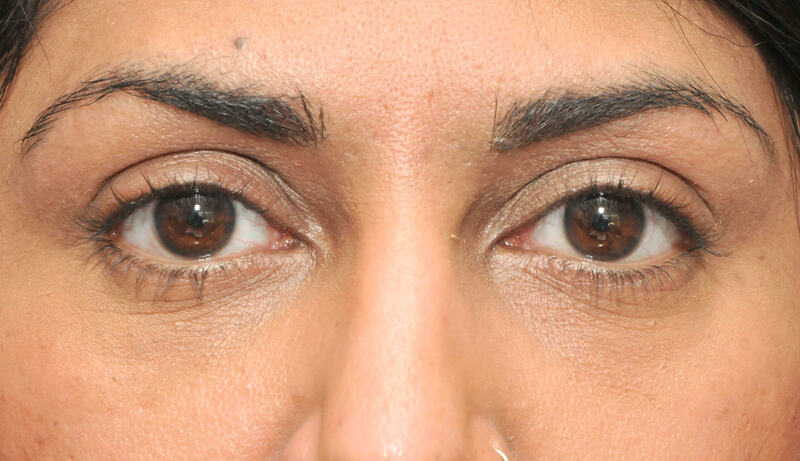 A patient with tear troughs causing dark circles. The appearance following tear trough Restylane injections. 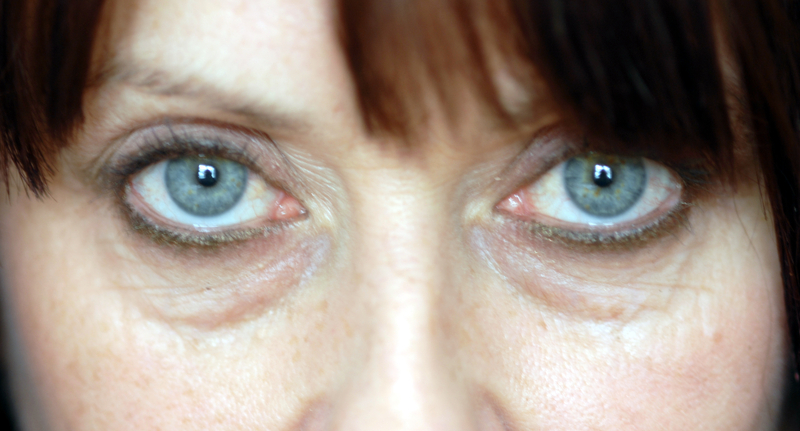 Not all patients who complain of lower eyelid dark circles or dark hollows are suitable for surgical improvement, usually in the form of a lower eyelid blepharoplasty or eye bag removal. The use of Restylane injections offers some patients a less invasive alternative treatment for their problem. Some patients also benefit from Juvederm Voluma injections which help to restore a youthful shape to the face by filling the inner and outer part of the upper cheeks. Although the use of Restylane as a soft tissue filler in other areas of the face is very well established and associated with high patient satisfaction, its use for the management of “tear troughs” and, with Juvederm Voluma, the management of a loss of soft tissue volume in the mid-face has proved to be a very good application for many patients. The effects of the injections last approximately 9-12 months before repeat injections are required. The treatment is undertaken as an outpatient procedure that offers immediate cosmetic results, and a very short recovery period. Restylane can also be injected as a trial treatment without removing the option of cosmetic eyelid surgery at a later stage. It can also be used for patients who have previously undergone cosmetic eyelid surgery and have some residual hollowing, particularly of the outer aspect of the lower eyelids. The treatment is associated with mild discomfort and a short “down time”. The injections also contain lidocaine, a local anaesthetic, which helps to minimise any discomfort. Bruising and swelling usually take a few days to subside. Occasional contour irregularities can occur following the injections. These are managed with massage after applying Auriderm skin cream http://www.faceandeyeshop.co.uk/product_list.cfm?id=25. 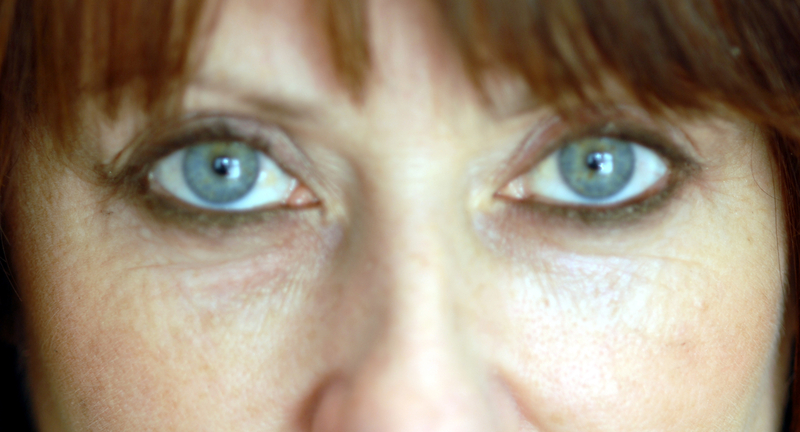 If a patient is dissatisfied with the results, the Restylane can be dissolved with the use of a small injection of Hyalase (an enzyme commonly used in local anaesthetic solutions given around the eye in patients undergoing cataract surgery). This is generally safe to use although there is a very small risk of an allergic reaction with the use of this enzyme. This is an off-label use of this enzyme. Tear trough rejuvenation is now usually undertaken using a specially designed blunt-tipped cannula (the TSK micro cannula), avoiding the use of needles for injection. The introduction of the TSK range of Micro Cannulas for tear trough Restylane injections offers the advantages of reduced discomfort, fewer needle-associated complications and a shorter recovery period when compared with a standard needle injection technique. Whereas a needle may pierce delicate structures (such as blood vessels) the TSK cannula has a blunt tip that will push these structures to one side minimisininjury to them as it is advanced. The TSK cannula is designed to deliver hyaluronic acid filler (Restylane) smoothly and evenly. This reduces the chance of a lumpy appearance because the delivery is more precise and well controlled. The risk of lumpiness, bleeding (haematoma) and injection into a blood vessel in the tear trough area is much reduced. In order to minimize the risk of bruising it is advisable to discontinue the use of Aspirin, Anadin or any anti-inflammatory medicines e.g. Indomethacin, Ibuprofen, Diclofenac, Voltarol, for 2 weeks before treatment provided it is medically safe to do so (please discuss this with your GP or physician if in doubt about this). It is quite in order to take Paracetamol and Codeine before this treatment. Excessive bruising can lead to staining of the Restylane gel in the lower eyelids and a bluish discolouration of the skin. This occurs rarely but is the reason why it is important to avoid medications which predispose to bruising. Bluish discolouration can also occur in some patients in the absence of bruising. Any previous eye, eyelid or facial surgery or treatments including refractive surgery or laser eye surgery. Any past dermatology history e.g. cold sores, eczema, rosacea, skin cancer. Any history of a dry eye problem. Any previous non-surgical aesthetic treatments e.g. Botox injections, dermal fillers injections, the use of IPL or laser treatments. Any medications you take (including over the counter products e.g. Aspirin, Indomethacin, Nurofen, Diclofenac or vitamin supplements). Please answer all questions completely and honestly as they are asked only for your own wellbeing, so that your cosmetic procedure can be planned as carefully as possible. The information is treated confidentially. If you are unsure of the names of any medications, bring them with you. The rest of your face is then examined. The general state of your skin is assessed and photographs of your face and eyelids are taken before surgery so that the results of treatment can be compared with the original appearance. The photographs are confidential and can only be used for any purpose other than your own records with your specific written permission. What are the possible complications of Tear Trough Restylane Injections? Most complications of the treatment are minor and are amenable to successful treatment. Bruising and swelling of the eyelids or the upper cheeks. Very rare: a localized allergic reaction in the form of firm swelling at the injection site. This has been seen in approx. 1:10,000 patients, and may occur a few days up to several weeks after the injection. They may last a couple of weeks up to several months in rare instances. Prolonged firmness, abscess, formation, scarring, or a grey discoloration may occur in less than 1:15,000 cases, lasting several months. Damage to the eye or eyesight including blindness from this procedure is an extremely remote risk in the hands of a specialist oculoplastic surgeon. All precautions are taken to minimize such a risk including the use of the TSK cannula wherever possible. Bluish discoloration over the injection site can occur in some patients. After the injections it is advisable to avoid rubbing the eyes, lifting weights or straining for a few days. Vigorous gym workouts should also be avoided for a few days. Make up should be avoided for 48 hours. You are advised to sleep with the head raised approximately 30 degrees to help to minimize any eyelid swelling. Contact lenses can still be worn following this type of treatment. Costs vary depending on the amount of Restylane required. For information about the cost of this treatment contact Mr Leatherbarrow’s clinic Face & Eye. To learn more about Tear Trough Restylane Injections, please contact us at today to schedule an appointment.